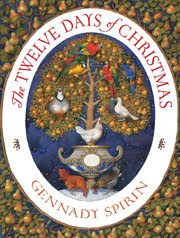 The Twelve Days of Christmas by Gennady Spirin. Marshall Cavendish Children's Books. 2009. Review copy supplied by publisher. The Plot: You know the song: A partridge in a pear tree. The Good: The illustration of each verse adds to what is there. So first, a partridge in a pear tree. Next, partridge and pear tree still there and now there is also two turtle doves. More and more is added, until the entire song is represented. It can be almost a game, as the book advances, to try to find all the parts of the song -- especially towards the end, where the tree and birds have shifted to the background horizon. Spirin's illustrations (water color and colored pencil) have the look of Medieval Art. You could imagine them hanging in a church or museum. A note at the end of the book gives the history of the book, along with the lyrics and music. Spirin's illustrations are always gorgeous. Love the inclusion of historical notes! Merry Christmas! Oh, and if you get a chance, listen to the a cappella group Straight No Chaser's version of the 12 Days of Christmas. Very humorous. I love his art work, it's gorgeous.